Cairns is considered the gateway to the Great Barrier Reef and as the below map shows, is also the arrival point for flights to the reef. 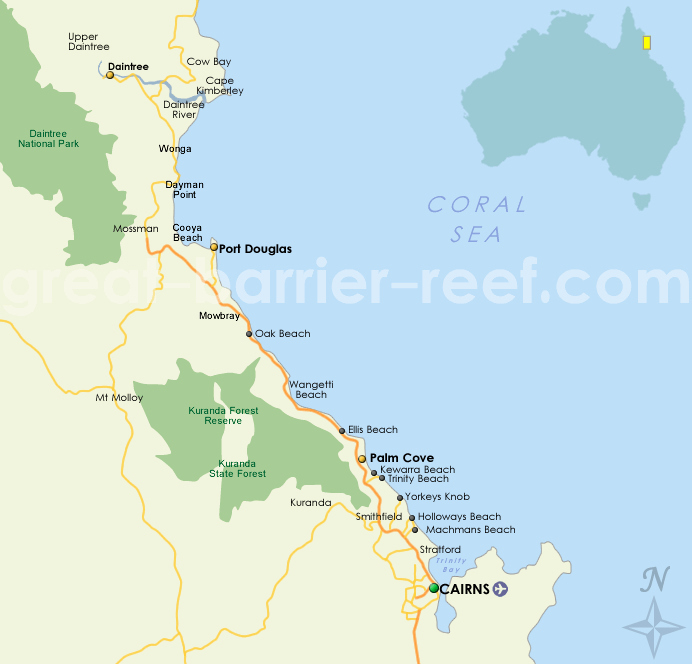 As the below map of the Great Barrier Reef shows, many of the beachside towns popular for holidays to the Great Barrier Reef are located along the coast just a short, scenic drive from Cairns. Although flying is the most popular way to get to the Great Barrier Reef, there are also rail lines that service the region. Offering 5 services per week, the Tilt Train is the most popular option and offers modern business class seating throughout. For a more scenic and spectacular journey, the famous Kuranda Scenic Railway is a popular tourist attraction and mode of transport that also departs from Cairns. Use the map of the Great Barrier Reef below to help plan your journey. *Note: This map is not a complete map of the Great Barrier Reef. It has the mainland section from Cairns to the Daintree including the major holiday destinations in Tropical North Queensland.